WANT TO WORK IN THE HEART OF BORNEO? JOIN US! 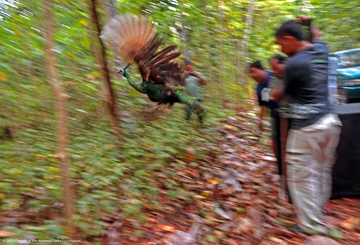 Alas Purwo, Banyuwangi, November 11, 2013 – FRIENDS of the National Parks Foundation (FNPF) staff this month drove seven hours through the night to return five endangered and rescued Javan green peafowl to the wild in East Java’s Alas Purwo National Park. FNPF’s wildlife rescue center at Tabanan in central Bali – one of only seven such centers in Indonesia – provides a vital link in the process of returning distressed wildlife to their natural habitat. FNPF took over running the 3,200m2 facility in 2011. FNPF cares for, rehabilitates and releases native endangered wildlife, most of which are the victims of illegal trading and poaching. “We left our rescue center in Bali about 10pm last Sunday headed for Gilimanuk and the ferry to the nearby island of Java. We wanted to go at night so that it wasn’t hot for the peafowls, so they would be as comfortable as possible,” says Dr Wirayudha. The FNPF team and its precious load arrived at the national park, on Eastern tip of the island in Banyuwangi district, around 5am. “We held a Hindu ceremony to offer the birds to God and get blessing before setting them free, We hope by doing this the bird not only get protection by the ranger but also God,” he says. The forest within Alas Purwo National Park, a natural habitat of the peafowl, is the last natural forest in Java that is protected from illegal logging. Along with the FNPF staff, two representatives from the Department of Forestry’s Natural Resources Conservation Agency (BKSDA) Bali made the journey to Alas Purwo National Park. For more information or to arrange an interview please contact FNPF’s Communication Manager Kirana Agustina on (+62361) 977978 or at :info@fnpf.org. Click here for information on various ways to donate, including TAX DEDUCTIBLE DONATIONS. Click the button below to donate using Paypal or Credit Card. Every year hundreds of people from all over the world come to Indonesia to volunteer with us in Bali and Kalimantan. Like it? Drop me a line.